Today’s special agents and intelligence analysts graduating from the FBI Academy are beginning their first assignments fully prepared for collaborative work in the field thanks to an innovative training program launched in 2015. Dubbed the Basic Field Training Course (BFTC), the new program offers an integrated curriculum that places new agent and intelligence analyst trainees together in a squad-like environment—the way agents and analysts work in actual FBI field offices. During the course, trainees learn skills like conducting investigations, interviewing, and providing briefings. Their academic training culminates with criminal and counterterrorism exercises modeled after real-world scenarios. Prior to launching the BFTC, agents and intelligence analysts historically trained under separate programs. While the new program integrates trainees where appropriate, specialized courses are still provided to students based on what their roles will be in the field. 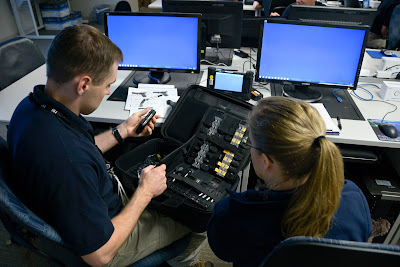 For example, special agents are instructed on the fundamentals of operating firearms and tactical driving, while intelligence analysts are taught how to analyze emerging threats and provide intelligence reports. FBI Director James Comey hands credentials to a new intelligence analyst during a Basic Field Training Course graduation last fall at the FBI Academy in Quantico, Virginia. The first group of graduates to complete the new training course walked across the stage at the FBI Academy this past fall to receive their credentials. One of those graduates was Alexandra, who now serves in the field as an intelligence analyst. Like other students in her class, Alexandra felt the program provided her with an invaluable experience. The BFTC was developed in response to a key recommendation made in the 9/11 Commission Report, which called for the FBI to integrate its workforce and implement a dedicated team approach to national security operations. The curriculum of the new program answers this call by providing trainees with the necessary building blocks to further the FBI’s dual law enforcement and intelligence mission. “Students completing the course now have a broader knowledge base to help them acclimate to the workforce,” said Catherine Fletcher, chief of the Training Division’s Curriculum Management Section. Fletcher’s group played an integral role in developing the program’s learning components. Numerous subject matter experts as well as Headquarters and field office personnel were enlisted to provide input on the fundamental aspects of the program. Once the course’s curriculum was produced, it was thoroughly reviewed to ensure the content was relevant, current, and met the needs of the FBI’s mission. In all, the program was built from the ground up over the span of three years. Now in its 10th month at the FBI Academy, the BFTC is providing hundreds of new agents and intelligence analysts with the tools to succeed in the field as a seamless unit. Over time, the program will continue to evolve as new investigative and intelligence-gathering techniques emerge.